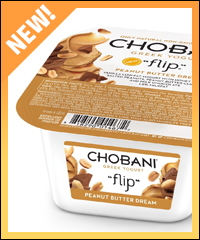 New Flavors: Chobani Greek Yogurt Flips - Get ready for yogurt that's flippin' awesome -- Strawberry Summer Crisp, Coffee Break Bliss, and (most exciting) Peanut Butter Dream! Add the tasty toppings to the all-natural, low-fat yogurt, and dig into a satisfying, protein-packed snack or mini meal. Each 5.3-oz container has 190 - 210 calories, 5 - 7g fat, 95 - 100mg sodium, 24 - 26g carbs, 0 - <1g fiber, 17 - 22g sugars, and 12g protein (PointsPlus® value 5 - 6*). Also new? The Simply 100 Mango Passion Fruit yogurt (PointsPlus® value 2*). Mmmm... Rolling out now nationwide. FDA Delays Requirement for Restaurants to Post Calories on Menus -- Now What? Check restaurant websites ahead of time. Many chains list nutritional info on their websites, including those that aren't yet disclosing stats on their physical menus. And even if there's no nutritional info listed, reviewing the online menu in advance allows you to take your time and identify your best options. Much smarter than making spur-of-the-moment decisions when you're super hungry. Click for more tips on ordering without nutritional info. Order smart, and have fun! 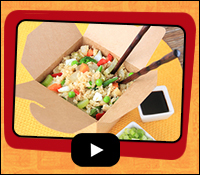 In case you missed it… Check out our latest Hungry Girl Hack Attack video: Cauliflower Fried Rice! That’s right; we turned the big cruciferous veggie into little rice-like pieces, and we’re serving it up Chinese-takeout style. See the all-star hack in action… Click ’n watch! Then get the full recipe here. ***Are you a "foodie" who likes trying new and adventurous items? Chances are, you're healthier than pickier eaters. A new study out of Cornell University Food and Brand Lab discovered that women who ate the widest variety of uncommon foods also rated themselves as more physically active and more concerned with the healthiness of their food. Just remember: Not all "health foods" are smart choices… Check those calorie counts! ***If you've been amending your carnivorous habits and cutting back on your overall meat-eating, you'll be happy to know that it's made a difference. The USDA reports that Americans consumed four billion fewer pounds of beef in 2014 than in 2007. A few of our fave ways to scale back? Use portabella mushroom strips in place of sliced beef, trade standard burgers for meatless patties, and embrace plant-based proteins. And that's all we've got. 'Til next time… Chew the right thing! Start an online party! Click "Send to a Friend" to pass around this info. Today, July 20th, is National Lollipop Day. HG tip: Lollipops are a great treat when you want to stave off a boredom-induced snack attack. Tootsie Pops are a 60-calorie classic.